i know, i know: it’s march already. half way into the month, and i’m finally getting around to hauling over the long-ago promised february roundup of books for the soul. 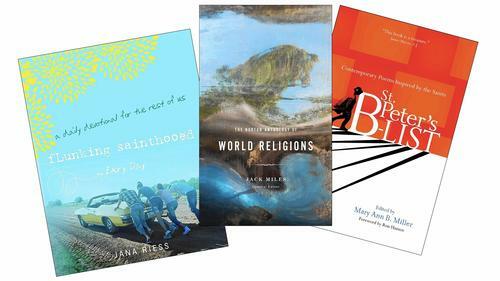 as i mentioned a few weeks back, a marvelous new assignment sent my way by my old beloved newspaper, the chicago tribune, is to read and round up a trinity of books for the soul every four to six weeks. since i’ve always believed in coloring outside the lines, my definition of what stirs the soul is a sweeping one. already, i’ve crept through picture-book shelves, and poetry tomes. i’m perusing the landscape of brilliant nature writing. and don’t be surprised if, one month, you find a book with very few words at all, allowing images — sketched or caught by the lens of a camera — to do all the soulful lifting. truth is, the soul, i do believe, is stirred far beyond the walls — or pages — of where you might expect to bow your head, bend knee, and offer up a vesper or three. in fact, it’s in the least-expected nooks and crannies where i’m most likely to find my breath swept away, and my soul most deeply stirred. stumbling on astonishment, to paraphrase the beloved poet saint mary oliver. so, before the march roundup hits the news stands, here are the three titles i found soulful in february. With more than 1,000 primary texts — Volume 1 covers Hinduism, Buddhism, Daoism; Volume 2, Judaism, Christianity and Islam — this instant classic allows readers to discover religions’ common threads, to plumb the sharp-edged distinctions, and to drink from the pure well of original text, not watered down through centuries or millennia of interpretation, clouded or otherwise. In a world where religion too often divides, this portable library of foundational works is intended “for readers of any religion or none.” Skeptics needn’t stay away. Scholarly texts, buttressed by timelines, glossaries, maps, and handy pronunciation guides, rub up against essays, poems, even hip-hop lyrics, all serving to define, expand and illuminate faith. Beginning with the brilliant 46-page “poetic prelude” by Miles — a former Jesuit seminarian, now distinguished professor of English and religious studies at the University of California, Irvine, who won his Pulitzer for his biography of God, no less — this foot-crushing tome is worth its weight, and its price tag, in wisdom — and enlightenment, of the truest kind. If you’re inspirationally inclined — meaning you tend to rip wisdom-steeped paragraphs out of whatever your read and pin them prominently wherever they’ll stir you to action (the pantry, the dashboard, tucked under the toothpaste) — this little book has, effectively, hauled out the scissors, mastered the clipping and pasting, and packed a year’s worth of finely curated wisdom into its pages. And these aren’t your everyday inspirers, the usual host of holy thinkers. Here, you’ll find the likes of Marmee from Louisa May Alcott’s “Little Women” or A.A. Milne’s “Winnie the Pooh.” You’ll find Annie Dillard at her literary best, and St. Augustine of Hippo, C.S. Lewis and Thomas Merton, for a sweep through the centuries. Kathleen Norris and Desmond Tutu are among the enlightened. The index at the back of the book will help you put your finger on thinkers from Angelou, Maya, to Singer, Isaac Bashevis. While it’s written with an eye and an ear to Christianity, this is a book that transcends denominations. Cracking open the pages of this collection, you have every reason to suspect you’re about to encounter a churchy gathering of dusty old lives of the saints, in stanza and verse. And yes, the verse — from poets Mary Karr to Dana Gioia — is interspersed with language lifted straight from prayer, familiar prayer, prayer some of us learned by heart long ago. But the words and images volley so swiftly from the banal, the earthly, to the sacred, the heavenly, that you are ever startled. And yes, saints are mentioned in many — but not all — of the poems. And not in ways you’ve encountered them before. Thus, it becomes a passing parade of modern-day wise folk with something to teach, a story to tell. i don’t think this will work unless you’re a subscriber to the Tribune’s Sunday literary supplement, Printers Row Journal. but here’s the link, just in case. and, please, pass along any titles anywhere if you’ve found they stir your soul. my only stipulation is that the books need to have been recently published, meaning within the last few weeks, or months at most…. It’s great to learn about the different avenues to finding the spiritual in the everyday. You’re still my fave, though.